True to its promise, the first public build of Windows 10 Technical Preview for Phones is now available for download just moments ago. However, it can only be installed to a number of Lumia smartphones at the moment. Included in the list are Lumia 630, Lumia 635, Lumia 636, Lumia 638, Lumia 730, and Lumia 830. The preview build will be made available for other Lumia smartphone later on but unfortunately, Microsoft didn’t announced any set release timeline for them apart from “over the next few months” description by Joe Belfiore, the company’s Corporate Vice President for its Operating Systems Group. 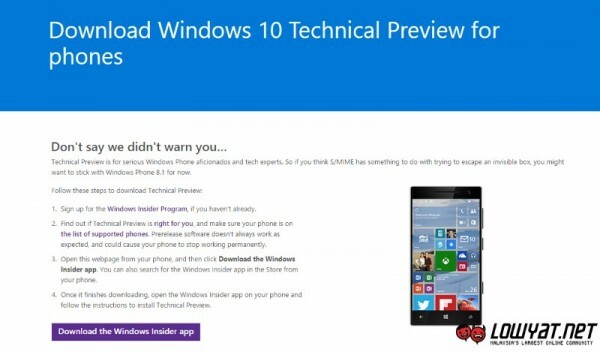 Nevertheless, if you owned one of the supported devices and are dare enough to test out early build of Windows 10 for Phones on your Lumia, do make your way to the Windows Insider’s official website to learn more.